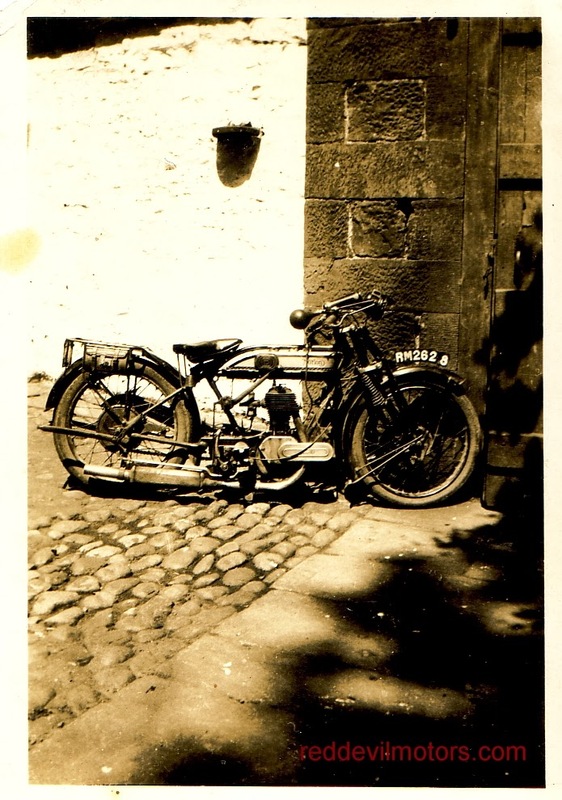 Easy to recognise this period snap as a Norton, more than likely a 16H and I would guess from 1925. Nicer composition than many amateur photos of the era. 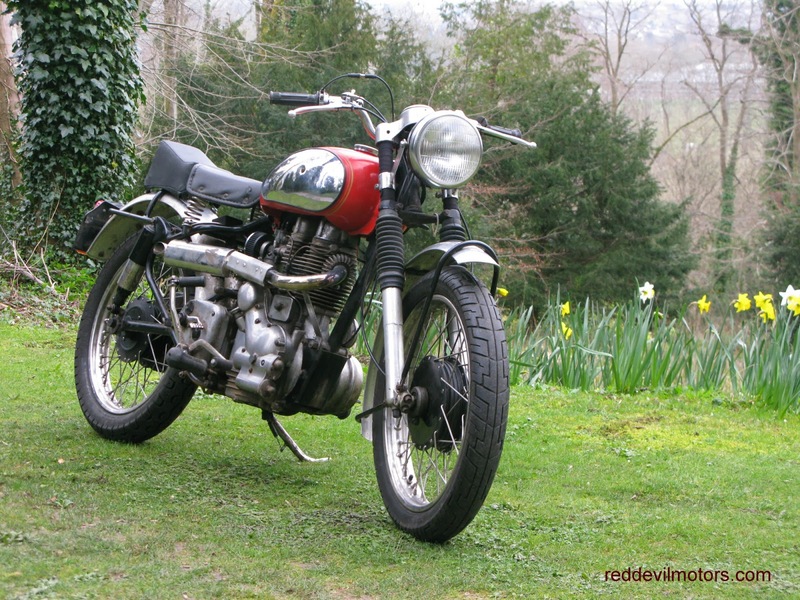 Mid twenties flat tank Norton 16H. 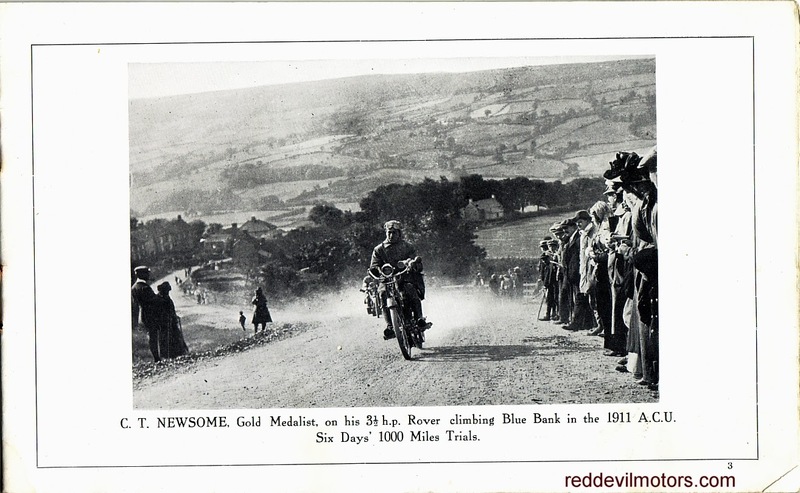 Many thanks to John de Kruif of www.vintagenorton.com for identifying the Norton as in fact probably being from 1926 - it has heavier weight Druid forks introduced in that year though still sports a saddle from the 1925 model year. Can you remember there was a time back in the eighties when a dedicated few loudly proclaimed that feet forward motorcycles were the future? Journalist Royce Creasey was one of the loudest and put his money where his mouth was by putting the Voyager into limited production. 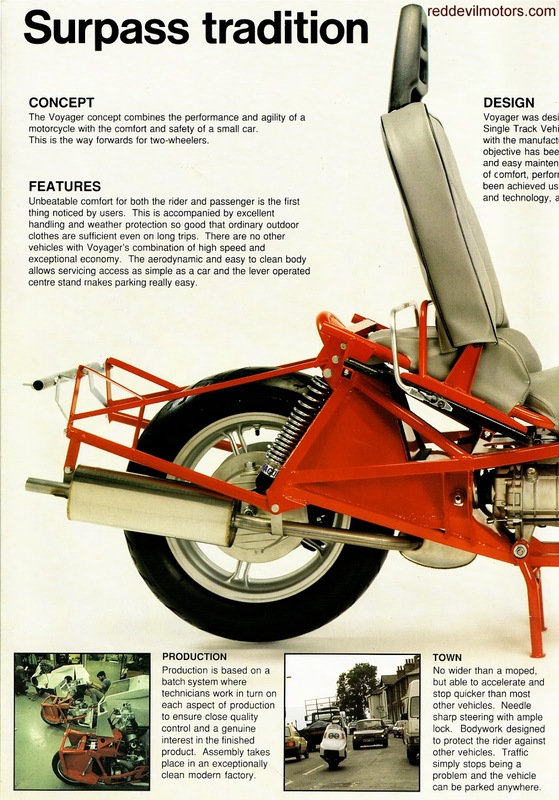 Problem was that most of us didn't want car like comfort and a windscreen on our cycles, we wanted raw and exciting, however efficient the feet forward alternative might be. We also on occasion wanted to carry a passenger. 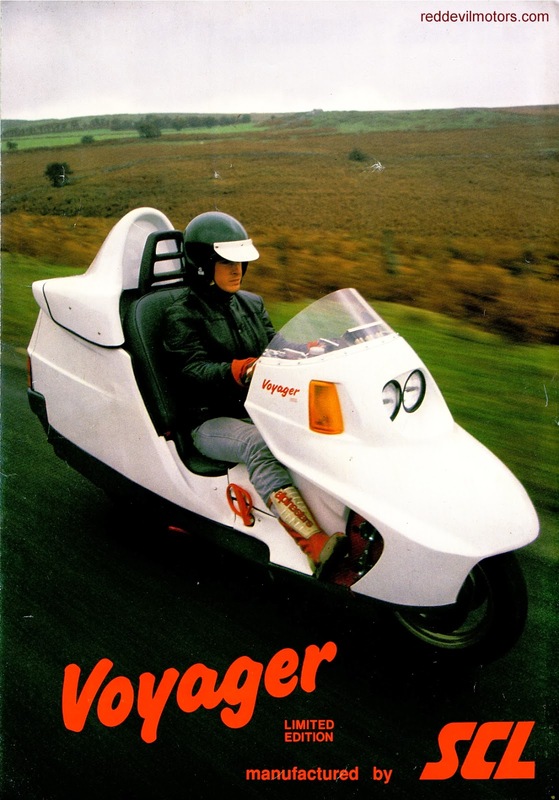 A strange, expensive, fibreglass cloaked reliant powered behemoth was not on our shopping lists. Turns out the feet forward proponents didn't get it entirely wrong, it's just that the future worked out slightly different to predicted as is the way. Witness the popularity of the super scoots such as the T Max - basically the same thing but with smaller wheels. A lot of large cruisers are veering in to feet forward territory these days and even the mighty Honda had a punt with the ff concept and went the whole hog with the DNA. The feet forward movement still seems to be alive and kicking judging by a quick trawl of the web with Royce Creasey still the flag waver leading the march. SCL Voyager brochure page 1. 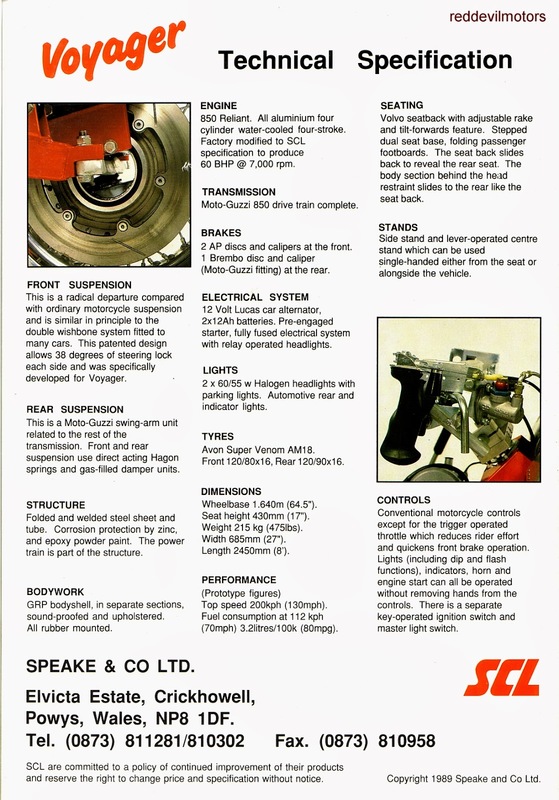 SCL Voyager brochure page 2. SCL Voyager brochure page 3. SCL Voyager brochure page 4. There's not often you get good news from the annual budget but this year the Chancellor has announced that the rolling road tax exemption for classic / vintage vehicles is back. This means that essentially from now on vehicles over 40 years old will be exempt from paying road tax. 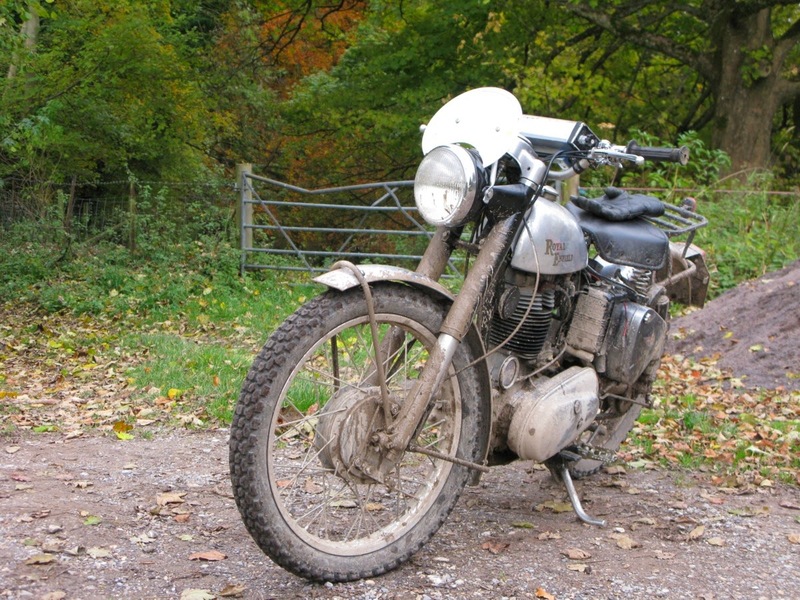 From 1st April 2015 vehicles over 40 years old will be exempt. Currently the cut-off date for exemption is pre 1 January 1973. From 1 April 2014 vehicles pre 1 Jan 1974 will be exempt and from 1 April 2015 the date is officially rolling. Also still unclear is what will happen when tax discs disappear later on this year. With no need for MOTs for pre 1960 vehicles and no tax discs will we have to declare our intention to use on the road or can we just go out at will with insurance the only bureaucracy we have to deal with? The truth will out in good time. 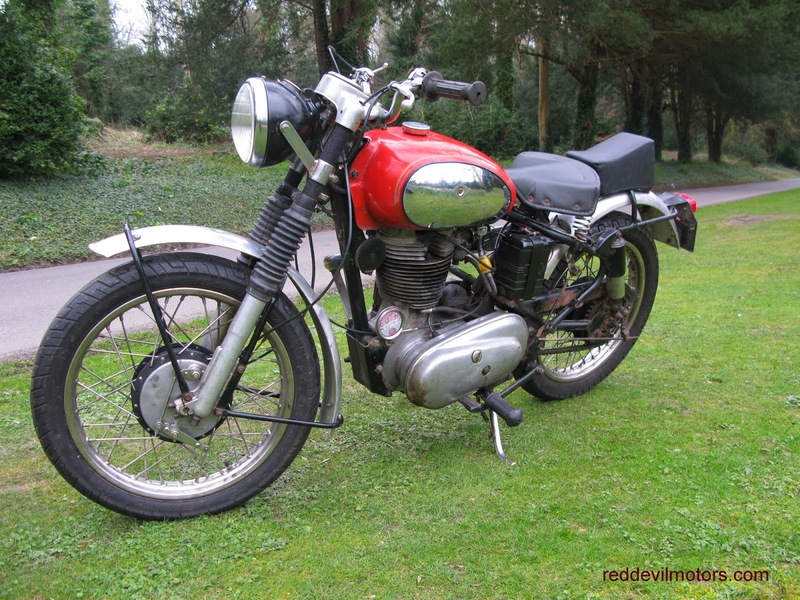 I had my 350 Bullet long distance trials mount up for sale in readiness for cracking on with the Redditch Bullet trials project but then an idea hit me. I needed some trials bits, I had some road bits spare why not juggle them around and create something different whilst giving me the parts I needed and clear out some other stuff in my way. So... off came the 18 / 21 wheels and on went a 19" stainless rim and spoke pair shod with decent grippy tyres. The sumpguard was ditched - it weighs a ton. Gearing upped (though wide ratio box kept as it makes quite a nice road box too). 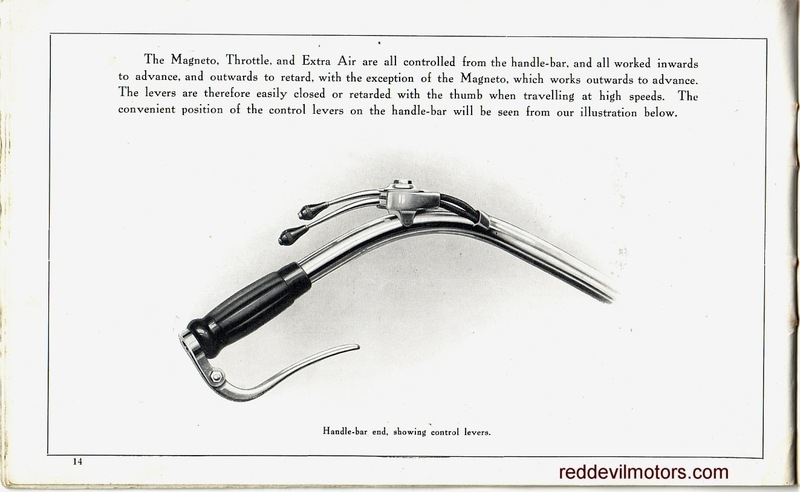 Flat handlebars, regular footrests and a vintage bum pad that was lying around. I took off the trials tank and added a new old stock eighties Indian Bullet tank without the large winged badges. The concept was fifties west coast bobber styling. I think it has worked pretty well. The only thing I didn't like was the look of the front guard - it was made for 21 inch wheels and gave too much clearance so this was ditched slightly after the pictures were taken and now it has a naked front wheel and looks a lot better for it. The starting point. 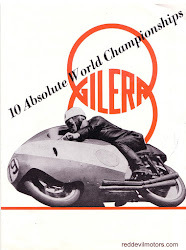 Bullet long distance trials machine. 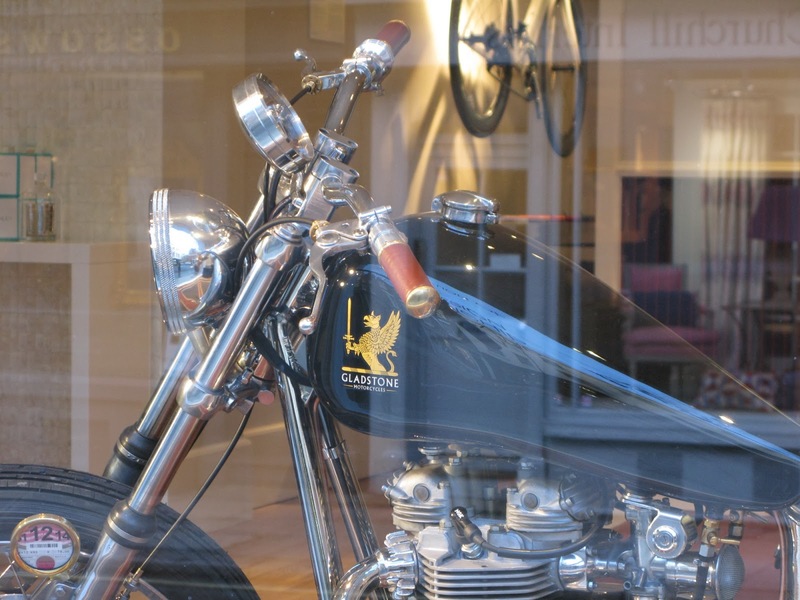 Bullet bobber off side view. I came across this old photo recently. Frankly it's a pretty awful image but what was interesting to me is that it appeared to be the same Seal Sociable as in an earlier blog post. Or at least so I though until I looked a bit closer - for one the sidecars are on opposite sides, this could however be down to the developer getting the negative back to front. This shot is certainly a studio print with the Seal as a prop. Most likely the other image is too. Seems a bit unlikely that there would be two different Seals both used as studio props. Seal Sociable sidecar studio prop. 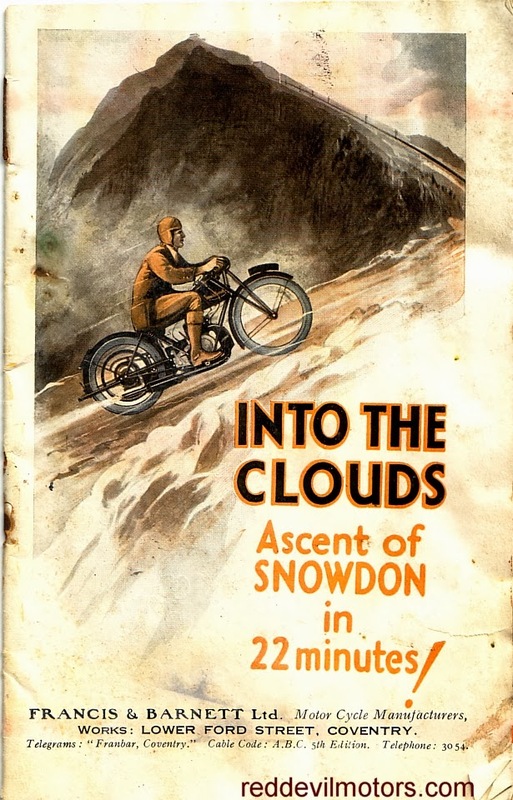 Francis Barnett ascent of Snowdon front cover. 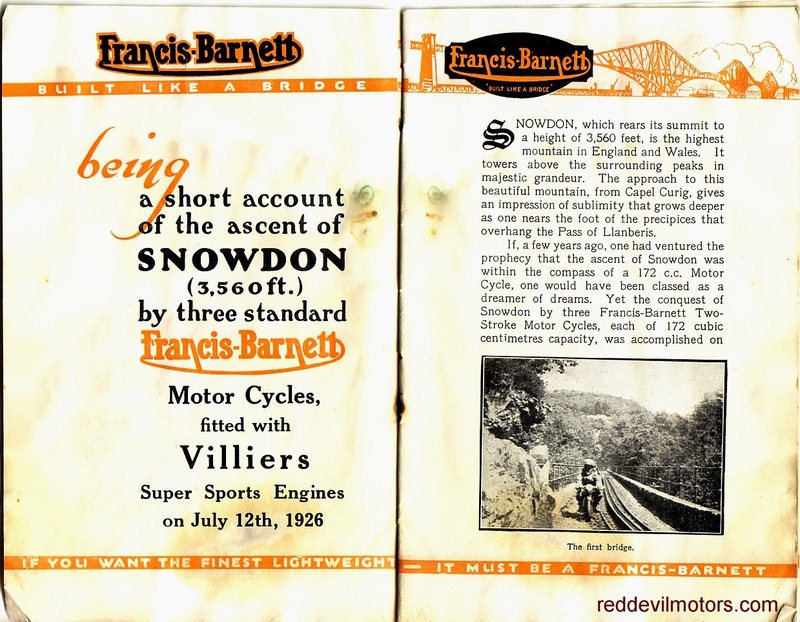 Francis Barnett ascent of Snowdon pages 1 & 2. 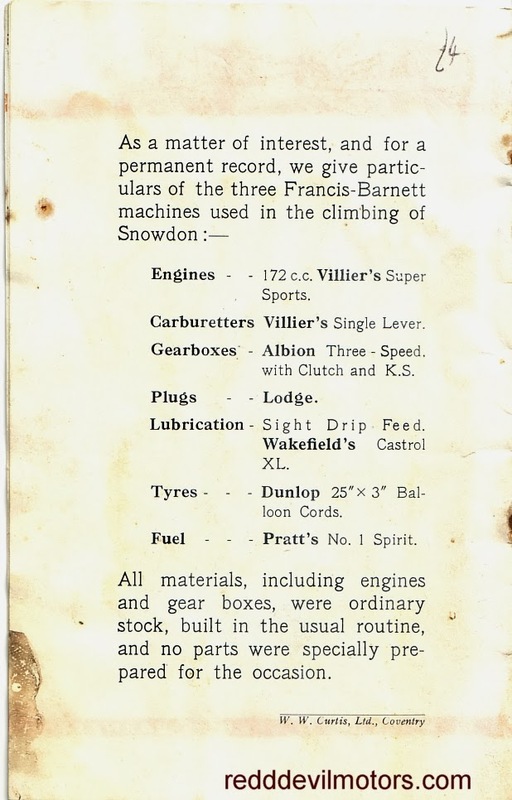 Francis Barnett ascent of Snowdon pages 3 & 4. 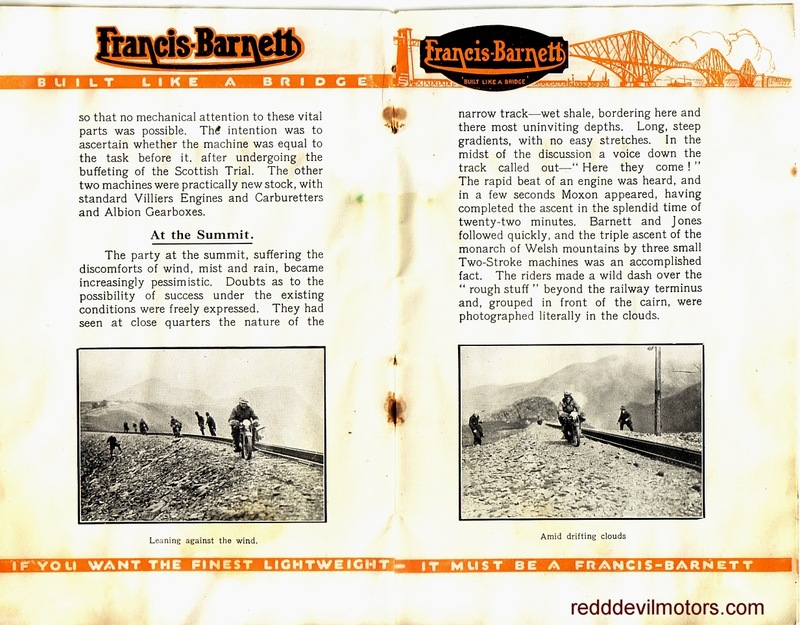 Francis Barnett ascent of Snowdon pages 5 & 6. 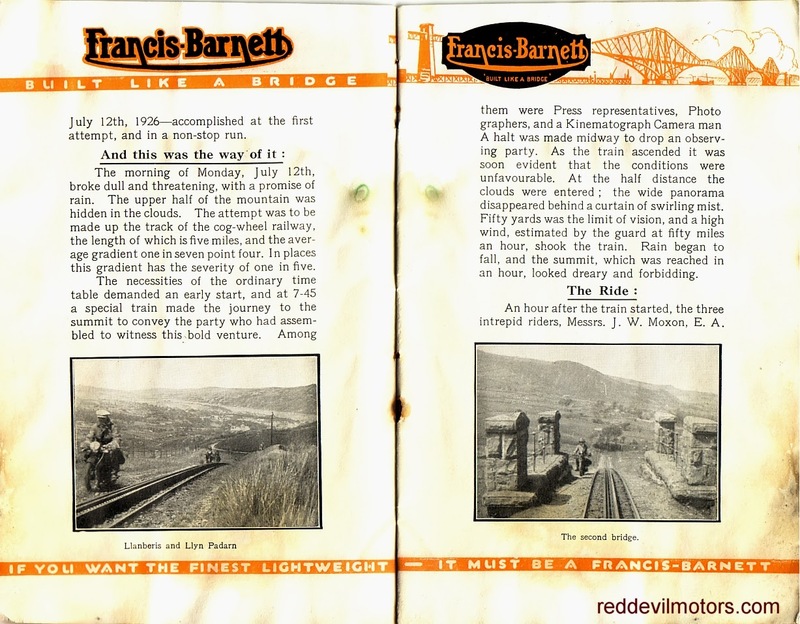 Francis Barnett ascent of Snowdon pages 7 & 8. 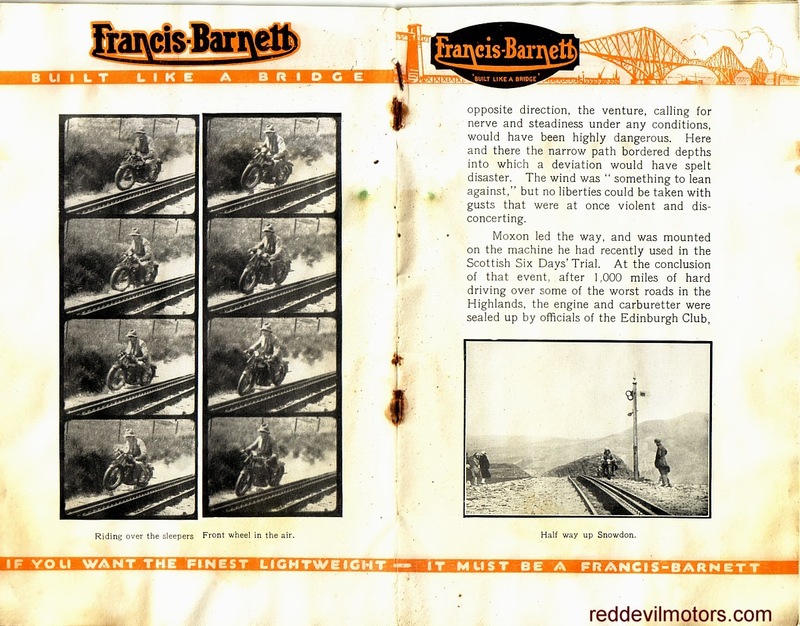 Francis Barnett ascent of Snowdon pages 9 & 10. 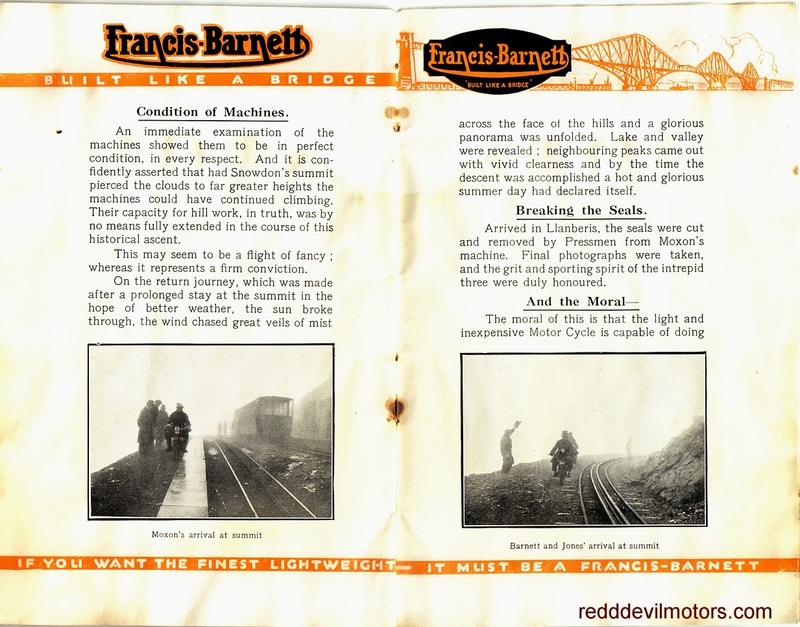 Francis Barnett ascent of Snowdon pages 11 & 12. Francis Barnett ascent of Snowdon pages 13 & 14. 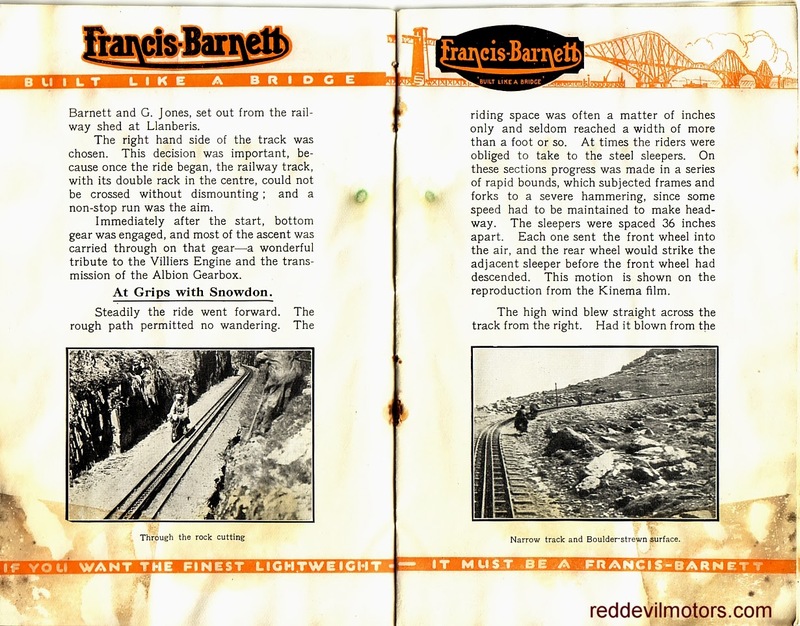 Francis Barnett ascent of Snowdon rear cover. 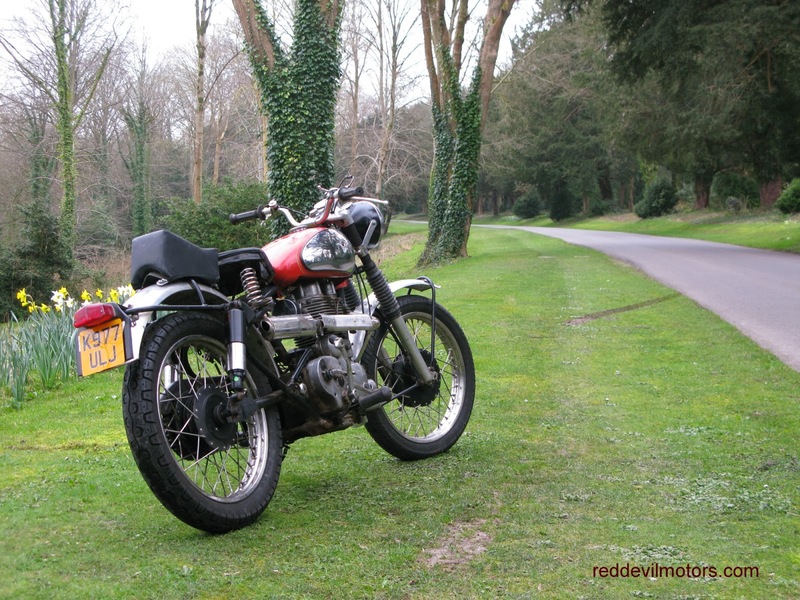 I hadn't sold the 350 Indian Royal Enfield Bullet after a couple of weeks of half heartedly offering it up so decided to have a bit more fun with it before passing it on by converting it in to a fifties West Coast style bobber whilst using some of the trials bits for my ISDT style Fury RE project. The conversion has been pretty successful, it's a blast to ride, light, satisfying power for back roads and very flickable handling. 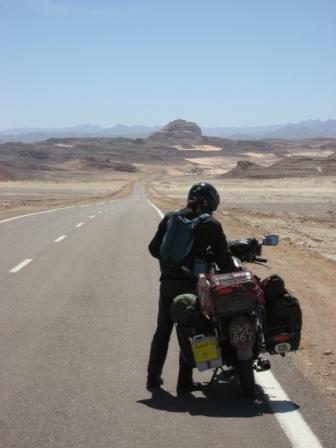 The quality of the movie isn't great - I've just got a new bike cam so am still learning with it. The strange wobble vision on move is I think down to vibration from the bike and the attempted compensation from the camera. 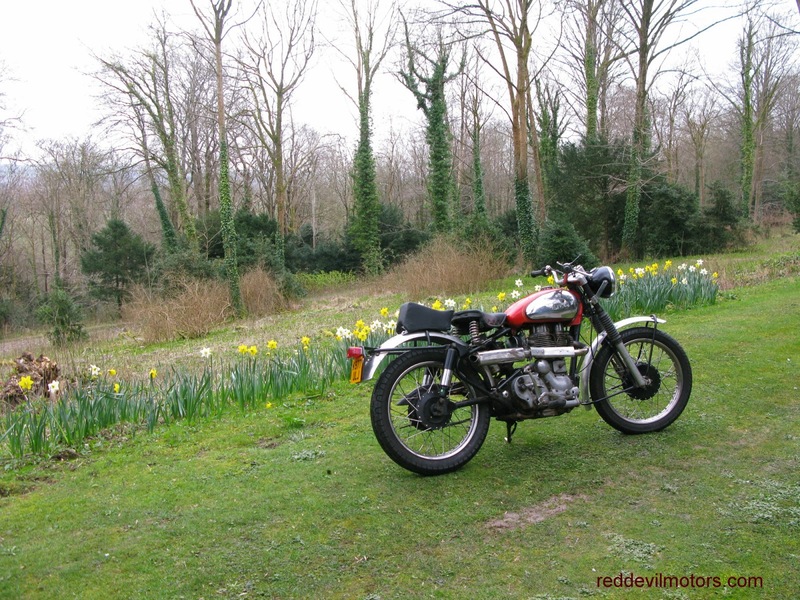 Anyways, the film kicks off with a cold start down to a tick over followed by a blast up Zig Zag Hill near Shaftesbury, an old hill climb spot. The speedo cable broke so no idea of speed, no doubt it felt considerably faster than it actually was! 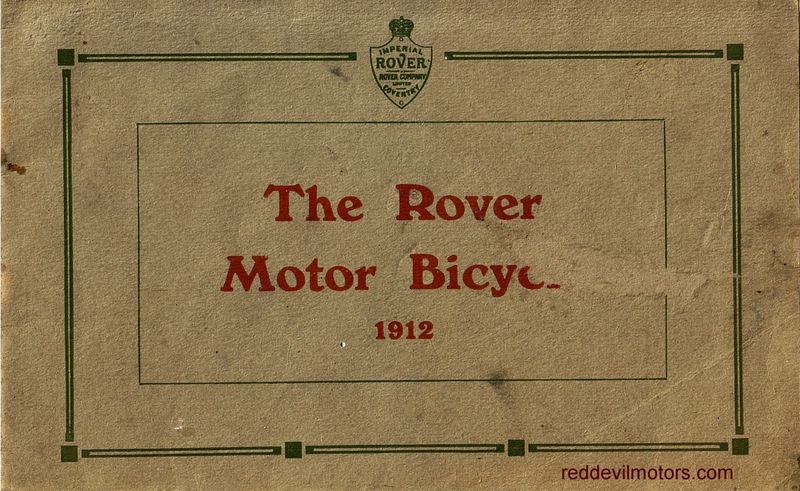 1912 Rover Motor Bicycles brochure front cover. 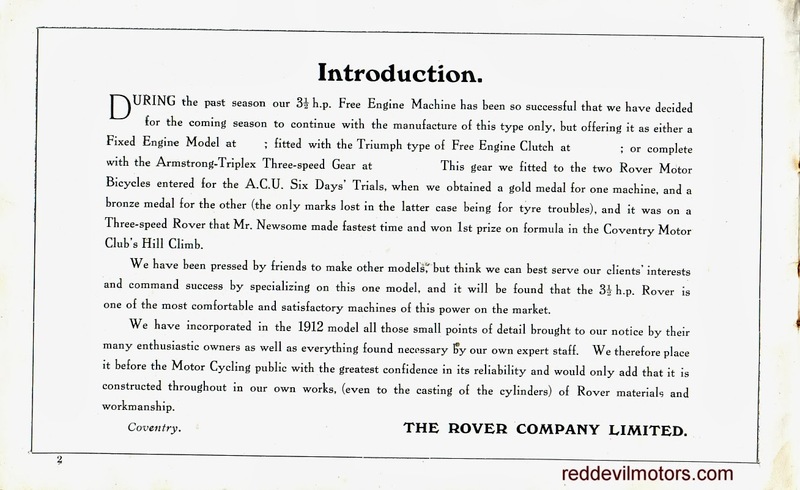 1912 Rover Motor Bicycles brochure page 1. 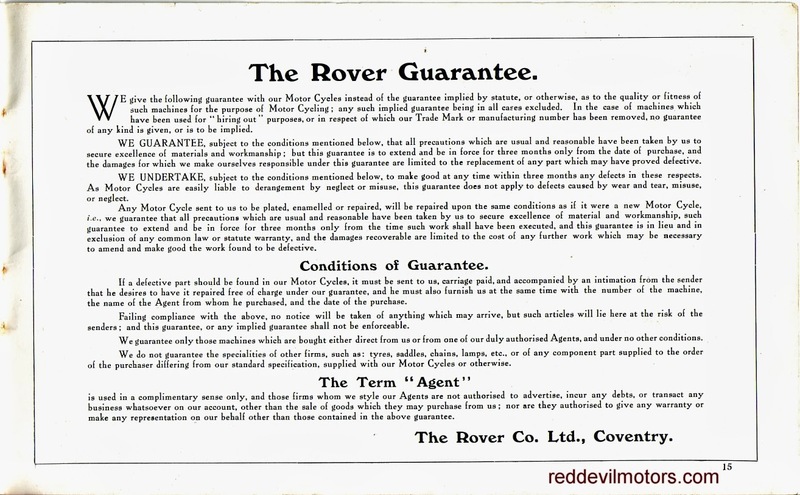 1912 Rover Motor Bicycles brochure page 2. 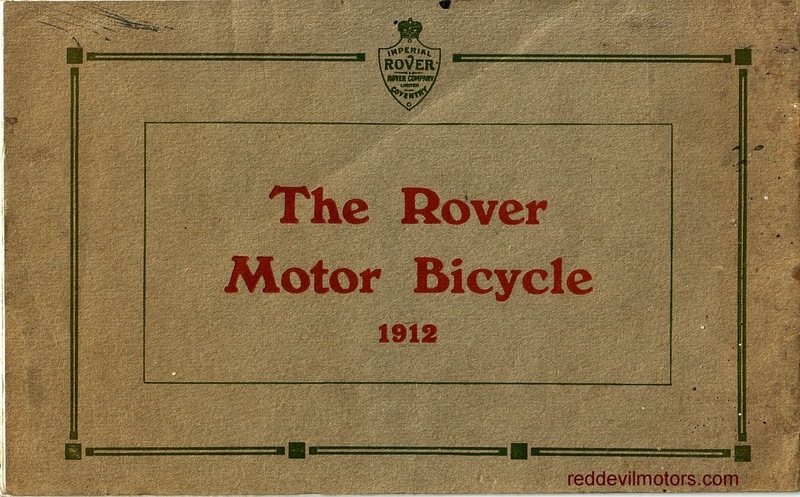 1912 Rover Motor Bicycles brochure page 3. 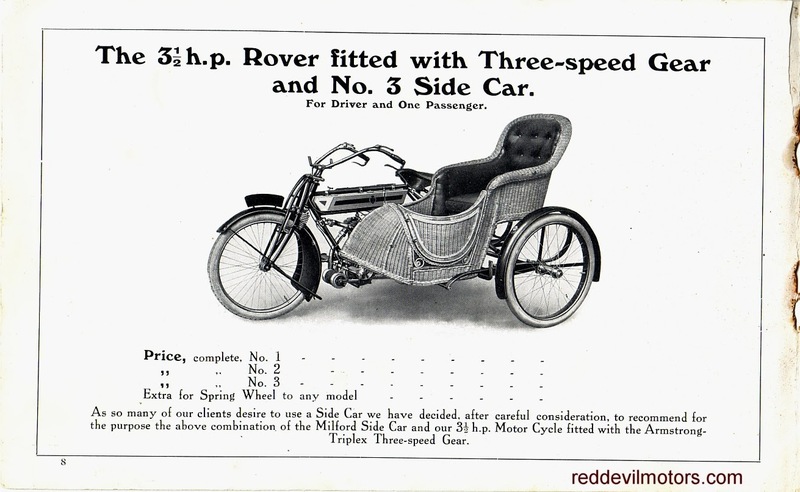 1912 Rover Motor Bicycles brochure page 4. 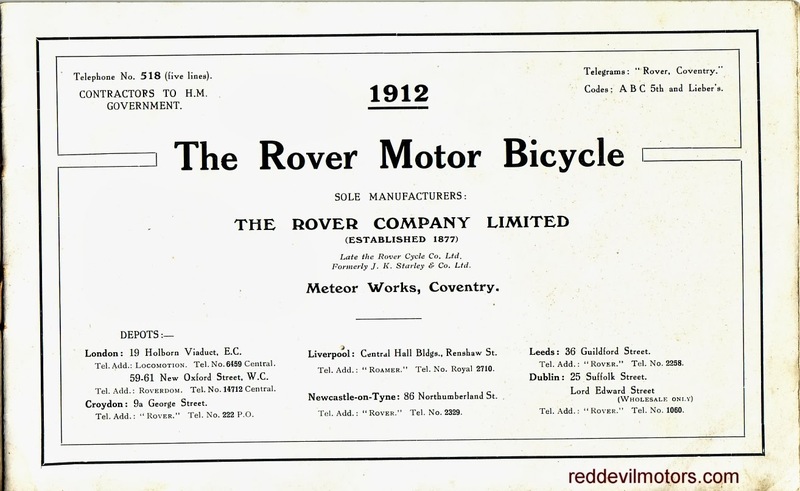 1912 Rover Motor Bicycles brochure page 5. 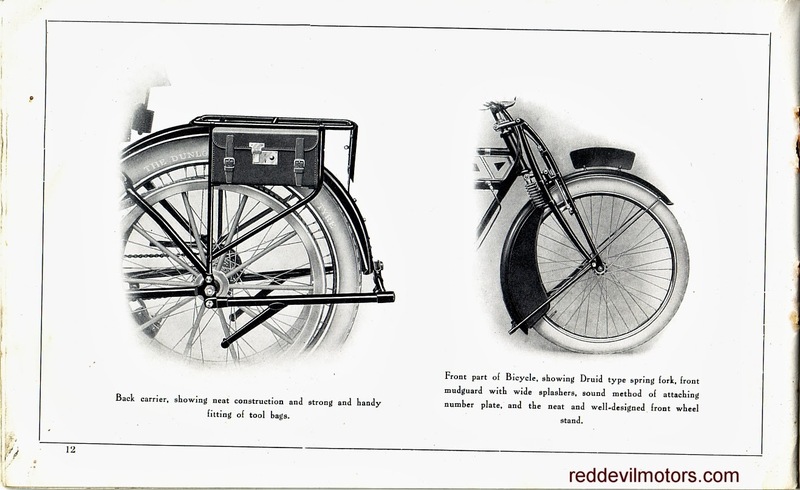 1912 Rover Motor Bicycles brochure page 6. 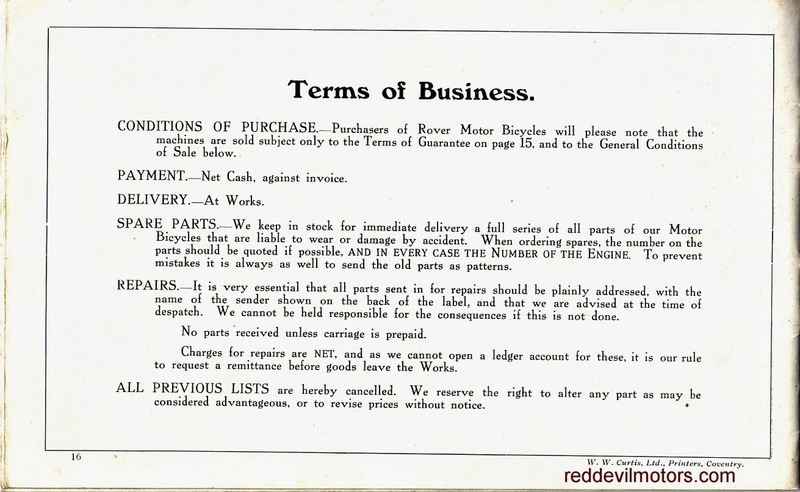 1912 Rover Motor Bicycles brochure page 7. 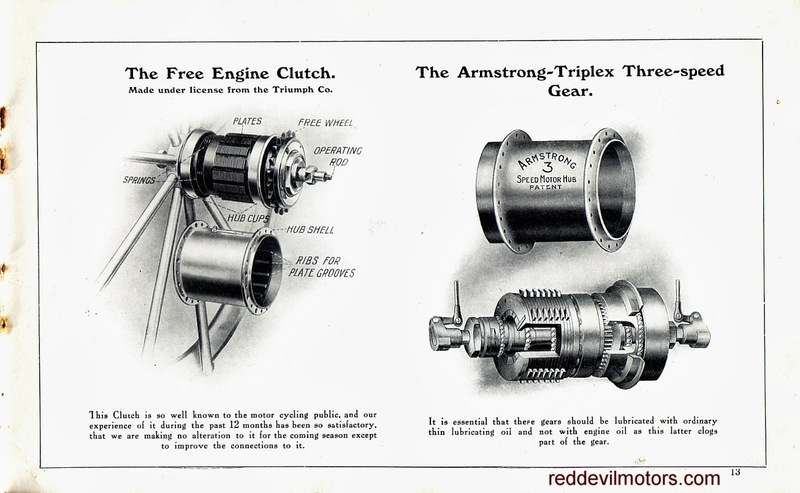 1912 Rover Motor Bicycles brochure page 8. 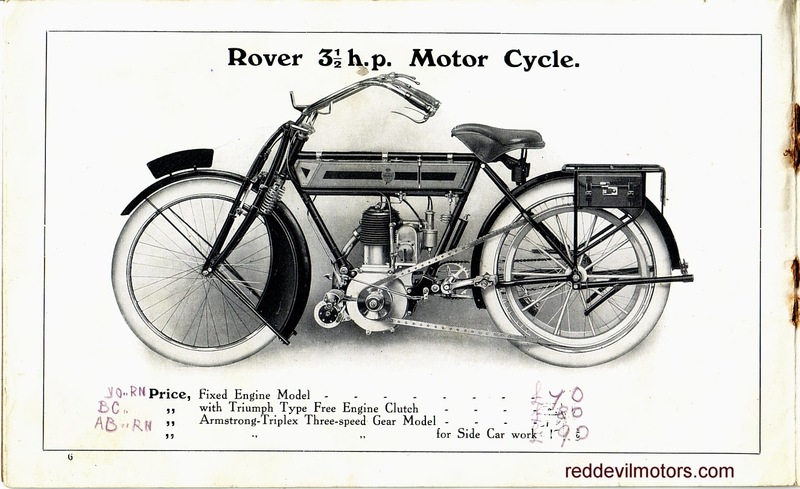 1912 Rover Motor Bicycles brochure page 9. 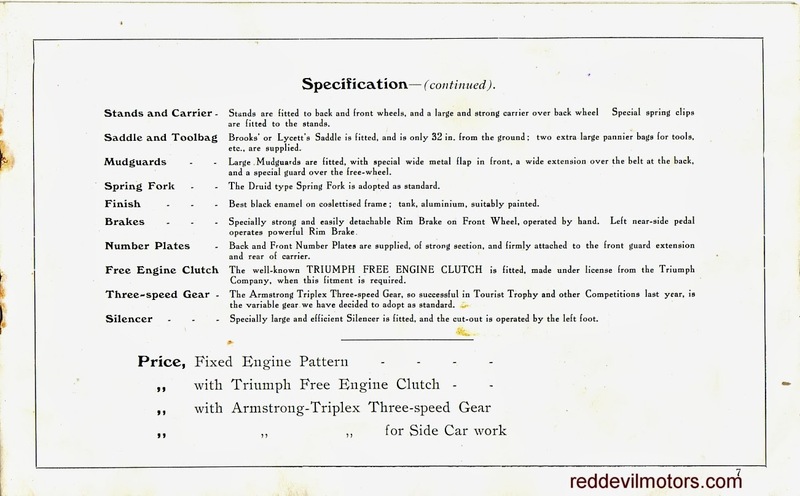 1912 Rover Motor Bicycles brochure page 10. 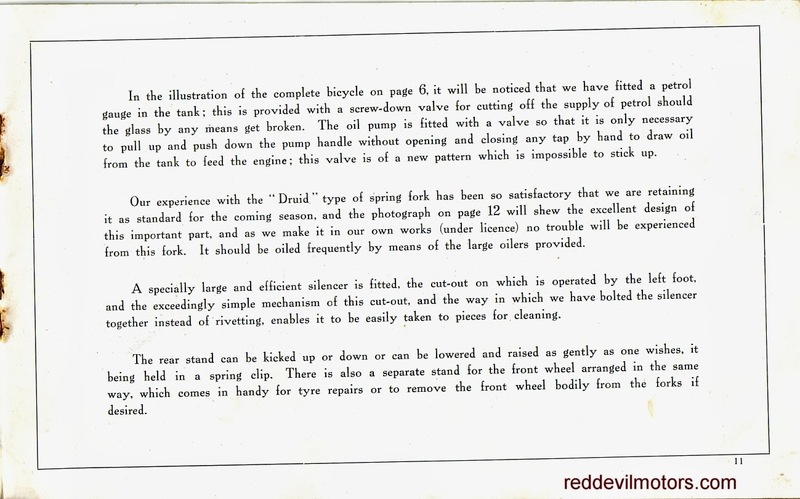 1912 Rover Motor Bicycles brochure page 11. 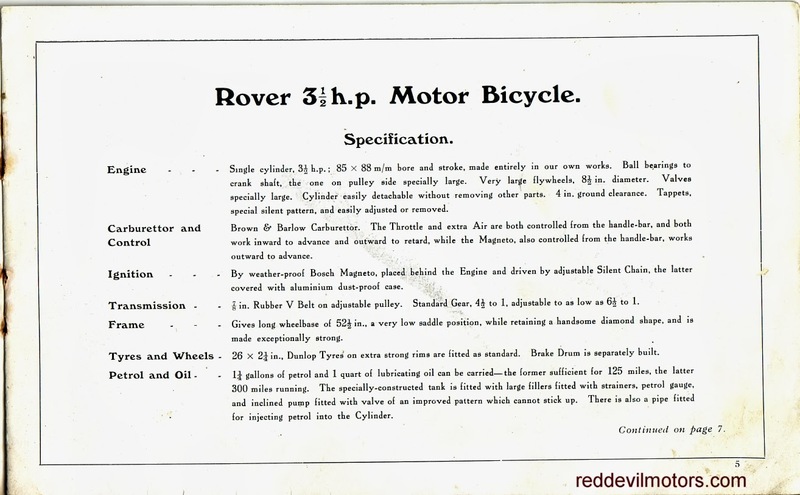 1912 Rover Motor Bicycles brochure page 12. 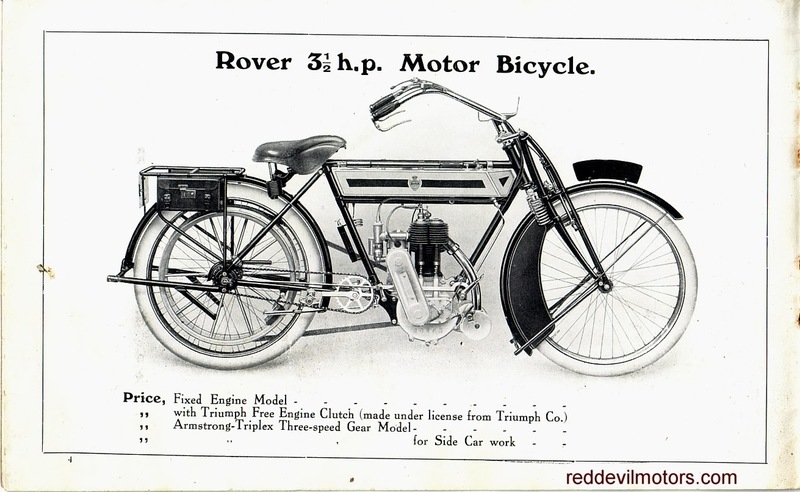 1912 Rover Motor Bicycles brochure page 13. 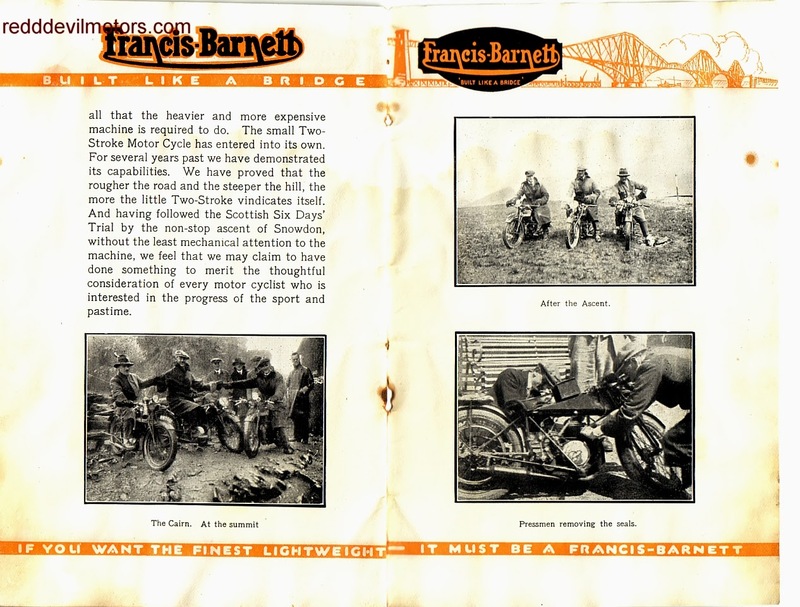 1912 Rover Motor Bicycles brochure page 14. 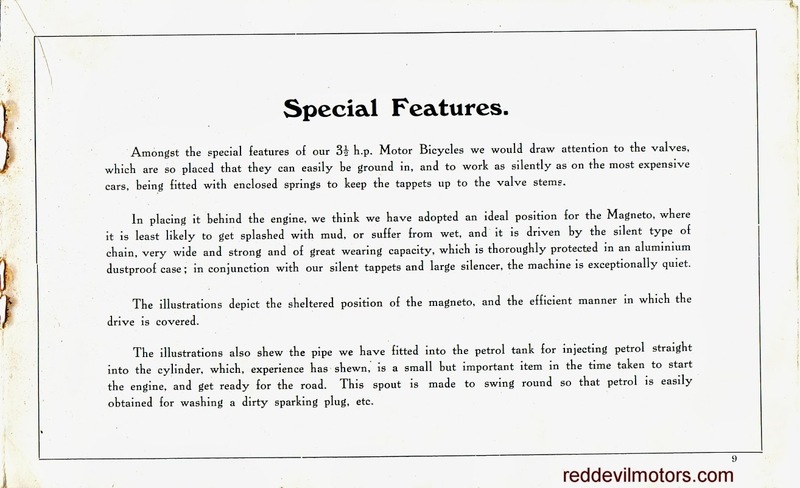 1912 Rover Motor Bicycles brochure page 15. 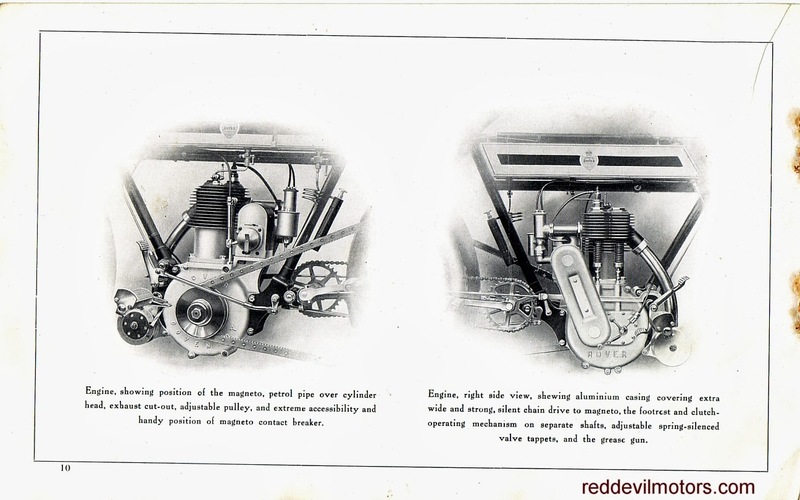 1912 Rover Motor Bicycles brochure page 16. 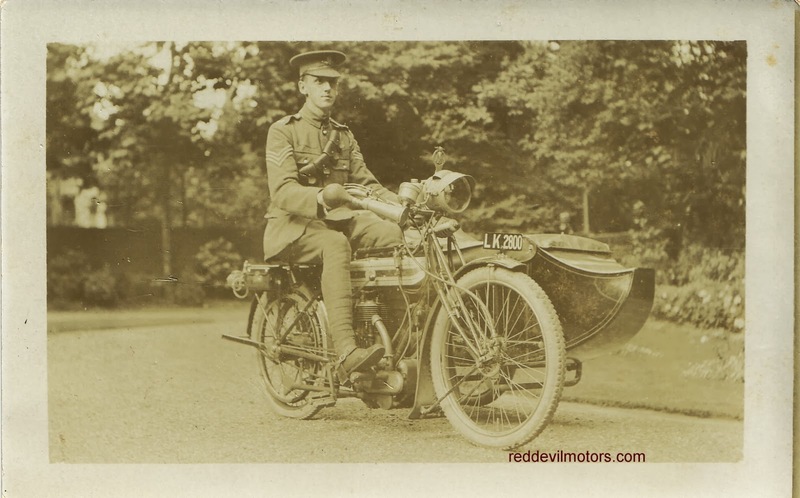 1912 Rover Motor Bicycles brochure rear cover. 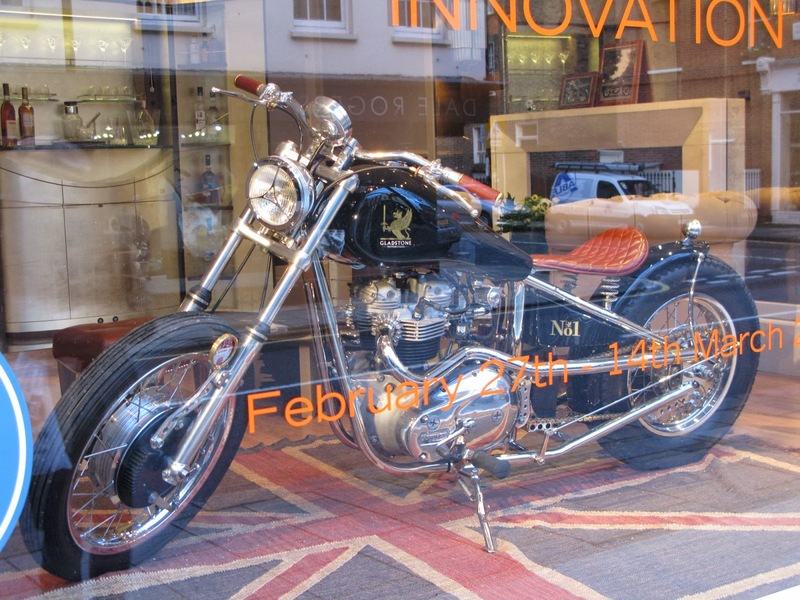 Another early Triumph picture. The machine looks fairly new and though the rider is in uniform it is likely a civilian machine. 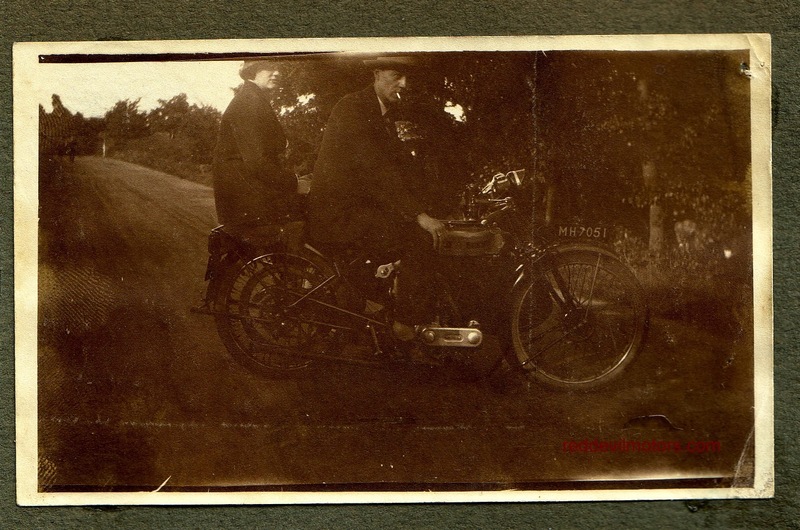 I presume it is a 3.5hp model and from 1910 1912 given the presence of pedalling gear though input from the more knowledgable would be welcomed. 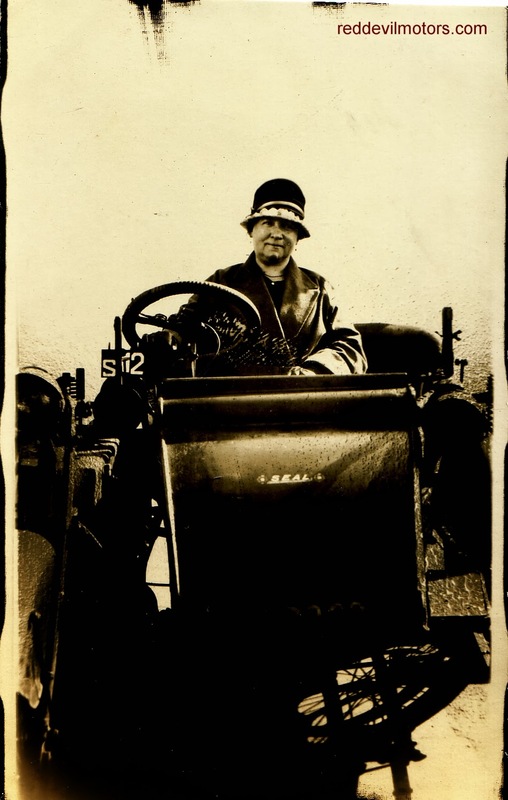 The proud owner has invested in a high spec of accessories with a rather grand lighting set, a large hooter and, unusually for the time, a speedometer. 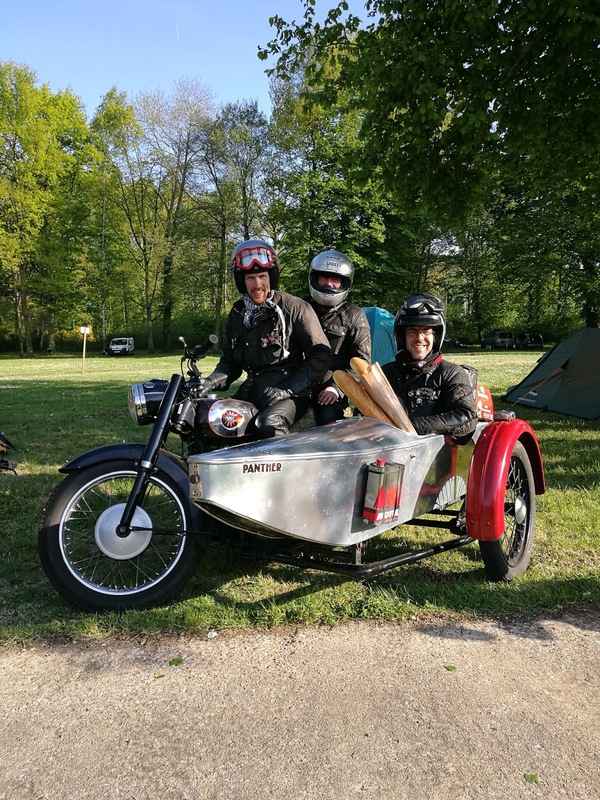 Veteran Triumph 3.5hp with sidecar. 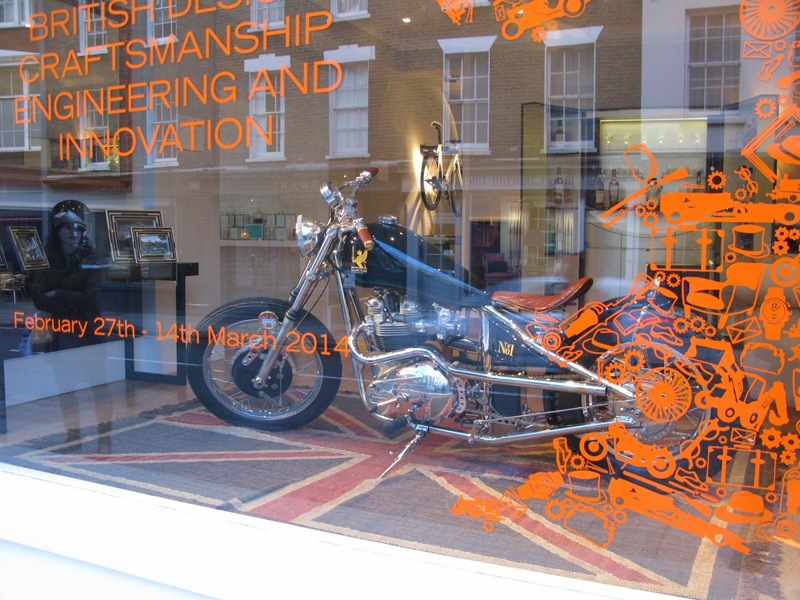 I was scuffing around Pimlico the other day and spotted the 'Gladstone' Motorcyle in the window of the posh design store Linley. I've got to confess that I hadn't heard of Gladstone before but it turns out it is the idea of affable TV motorcycle pundit Henry Cole. 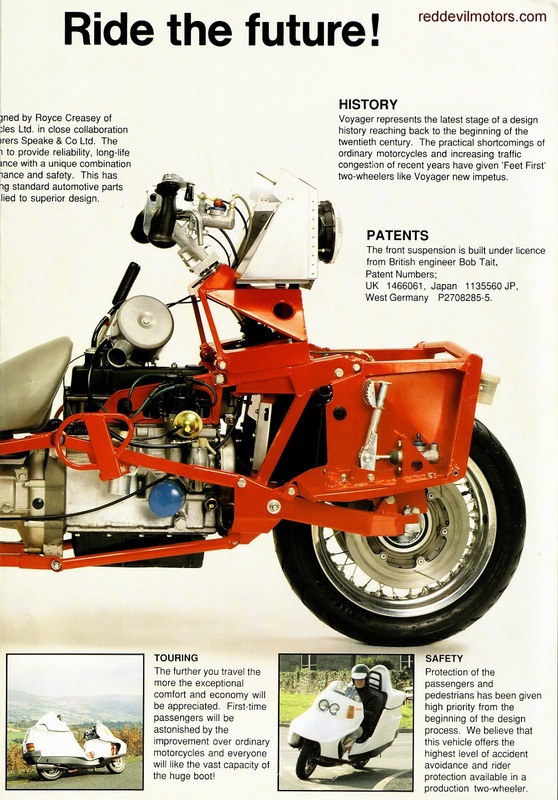 The frame is Metisse designed and the engine a Triumph T140. Finish is excellent and it is a fine looking machine. There's a lot of designer guff written about it in Linleys but the bottom line is it is a looker and probably a hoot to ride. Will they sell any? Well, it's not priced but it looks like it will certainly not be cheap, then again I doubt it was cheap to make. 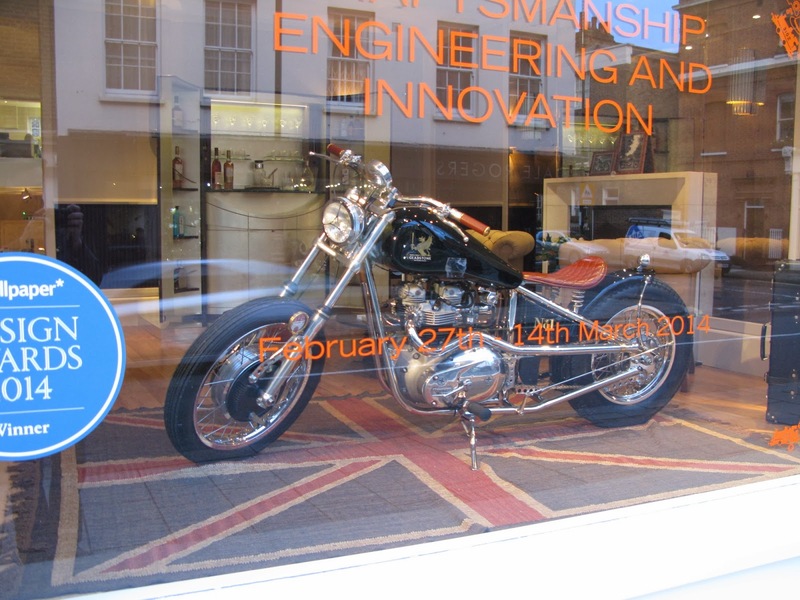 The feel they are going for is english gentleman's speed machine and it fits the bill. It will be interesting to see what other folks think about it. More details on the Gladstone website. 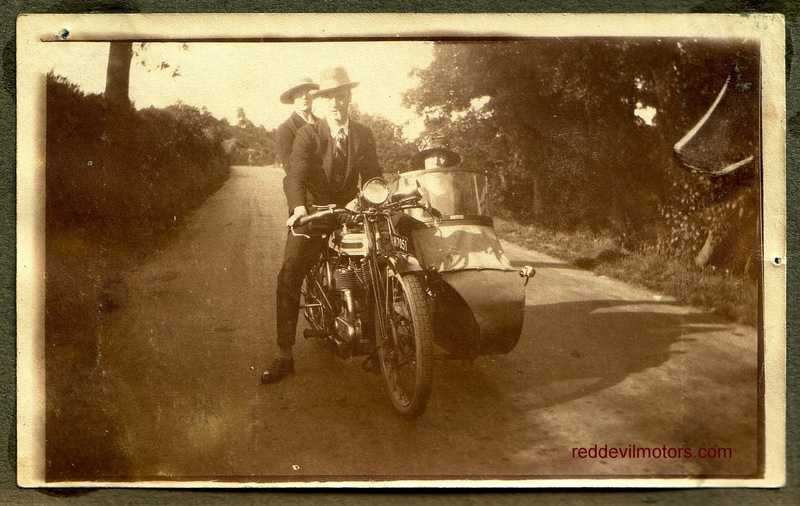 1925 Triumph Model P with sidecar.